Cowley Manor is an impressive, quirky hotel in the rural Cotswolds. The glass-fronted C-Side Spa is an inspired piece of modern design, sunk into the hill to one side of the hotel. 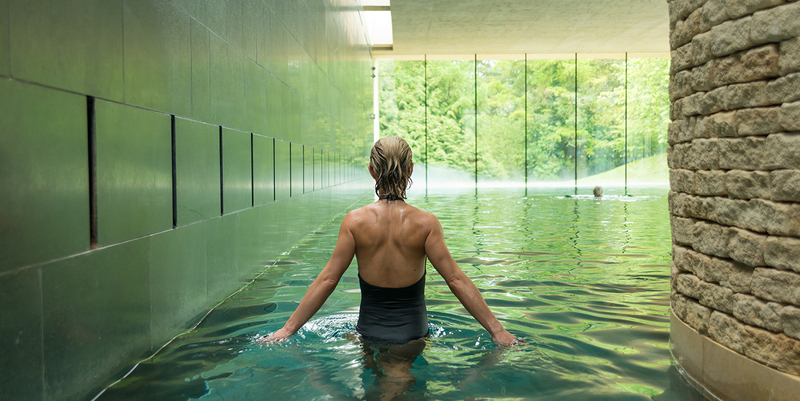 The slate-lined indoor pool and outdoor heated pool are a real treat, as are the relaxing treatments with Green and Spring products, created using the spring waters and herbs from the grounds of the hotel. Highlights include the pamper picnics, poolside bar and, if you're staying, fabulous bedrooms. Make time to check out the art work scattered around the grounds. Cowley Manor is a quirky Cotswold house set in 55 acres of parkland, woods and meadows, near the Regency spa town of Cheltenham. Admire the clear lakes brimming with lilies as you approach the former stately home, with its 30 bedrooms and revered restaurant. 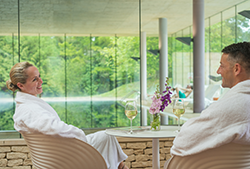 The glass-fronted, stylish C-Side Spa uses simple, contemporary design to bring the outside in (think large windows and natural materials). Treatments showcase C-Side's own Green & Spring product range and techniques. Overlooking the indoor and outdoor pools, C-Side's open reception area is the heart of the spa. Its brick walls, white chairs and colourful cushions set the scene for a modern, funky spa experience with a taste of Mediterranean charm. Staff took time to chat through the menu and products with us, ensuring we selected the best treatment for our skin concerns. The entrance to C-Side's changing rooms is at the end of a glass corridor, where green slate floors, chunky wood and polished concrete create a natural space with an industrial edge. Tall, skinny lockers, long enough to hang clothes, each contain a robe, towel and flip-flops. The vanity area is complete with hairdryers and Green & Spring cleanser, toner, facial and body moisturiser. The trio of showers, partially screened by misty glass, contain Green & Spring shampoo, shower gel, and conditioner. 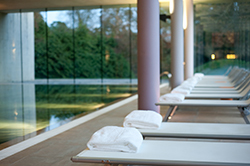 Design aficionados will love C-Side Spa's 17-metre slate-lined pool with its Cotswold-stone edge and emerald water. 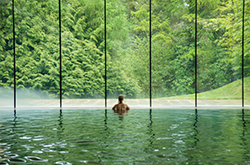 Swim to the side and gaze at the fir trees through floor-to-ceiling windows. Help yourself to water from dispensers set up between the poolside loungers. Vivid red mosaic tiles surround the two showers; take a turn under one before entering the not so steamy steam room. A classic wooden sauna seats around six. C-Side's outdoor area is a real highlight; we felt like we were in a Mediterranean garden. Swim in the heated 15-metre pool or lie on a lounger with its own shade shaped like a leaf. There are multi-coloured beanbags here, too (we told you it was quirky). The relaxation room is particularly compact, accommodating a maximum of three people at a time. A glass wall shielded by threaded curtains lines one side; there are also two comfortable leather chairs and a cosy booth strewn with purple cushions. Help yourself to a magazine, a cup of cucumber-infused water or herbal tea. Our "calming" tea contained chamomile, lime flower, lemon balm, rose and passion flower. 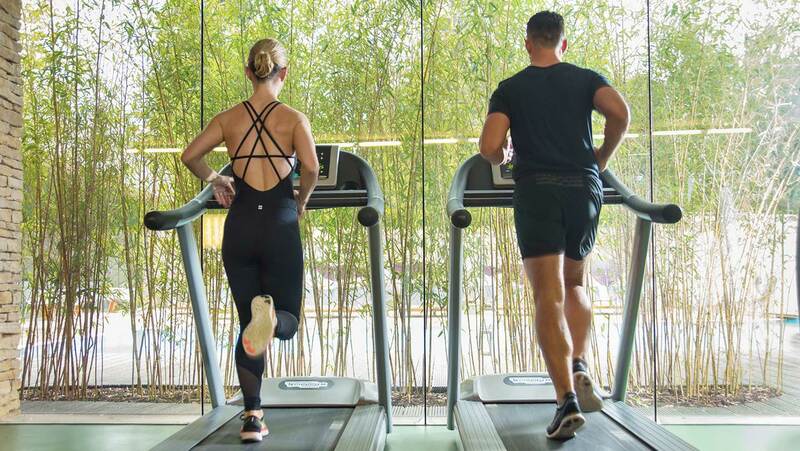 C-Side Spa also has a large gym equipped with treadmills, weights and training machines where you can exercise while looking out over the terrace. 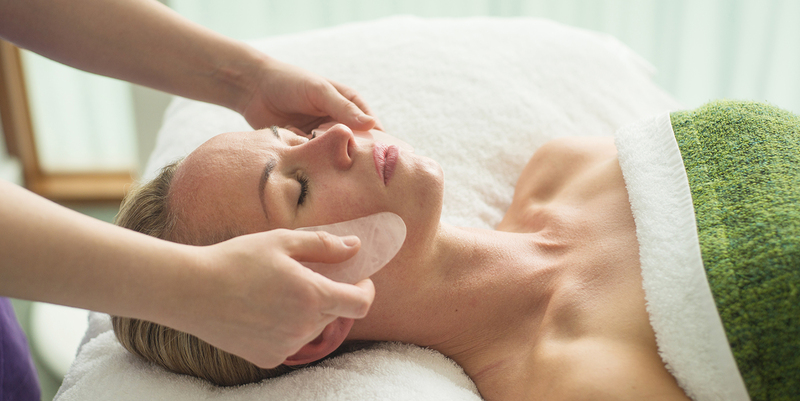 We tried the Green & Spring Facial (60 minutes, £80). My therapist, Hebe, met me in the spa reception area where I had just completed a consultation form. She escorted me through the main corridor to a naturally lit space where the treatment rooms are located. The treatment rooms at C-Side are beautifully designed and in keeping with the countryside location and Green & Spring range. Daylight floods through the rooms, while a fresh palette of white and green complements a wall of quirky bird wallpaper. I was delighted as I stepped inside. Hebe began by explaining the treatment, then left the room so that I could get comfortable on the treatment bed while selecting some music from a menu. 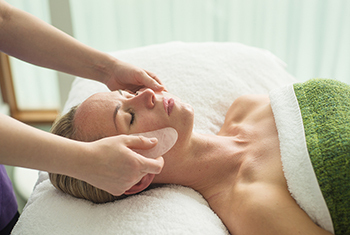 The facial began with a cleanser which Hebe massaged into my décolleté, neck and face using upward movements; she removed this with steamy hot mitts. A gentle exfoliation followed which felt thorough without being overly abrasive. Again, Hebe used hot mitts to remove the scrub, leaving my skin feeling fresh and tingly. Hebe brushed a honey milk oil onto my face and neck before using a herbal compress to apply comforting pressures onto my face and neck. This felt very relaxing. Hebe used two masks: the first was rich and creamy to soothe my skin in preparation for a neck massage; the second mask was lighter. While this worked its magic, Hebe performed a relaxing scalp massage. Once the mask was removed, Hebe applied an eye cream and moisturiser – both natural products that smelled like a British summer garden. After the treatment, Hebe offered me a choice of tea: "Energise" with citrus and Rooibos sounded right for me. Sadly, the small relaxation room was too full on my visit; I took my tea outside to enjoy the sunshine and continue relaxing. C-Side's Green & Spring products embrace native ingredients from the British Isles, such as English lavender, rosehip, dandelion, elderflower and thyme. The result is lightly scented products that feel "pure" on the skin. Aside from signature Green & Spring massages and emerginC facials, C-Side also stocks Pinks Boutique products for an impressive list of specialised pregnancy and post-natal treatments. 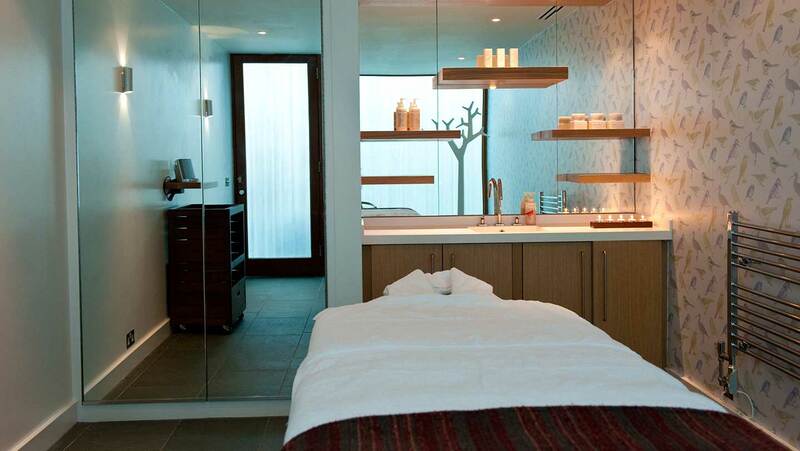 Two-hour daylight or twilight spa packages include a two-course lunch or dinner. Our pre-ordered lunch was served in the lounge in the main hotel, a short walk from the spa. While you can dine in your robe (several guests did just that), you have to walk outside to reach the lunch venue; not ideal in the colder months. We opted for fishcakes with home-made tartare sauce which was hot and comforting. We accompanied this with a fresh elderflower pressé, although several guests were enjoying glasses of fizz. There's also a tempting menu of desserts if you wish to indulge. In the evening, the Malt restaurant at Cowley Manor offers some classic and unusual dishes such as octopus carpaccio or John Dory with nettle gnocchi. If it's a sunny evening, opt for a seat outside and dine in view of the gardens. We ordered the vegetarian dish of baked aubergine and were surprised at how pretty and tasty it was. We didn't have room for pudding but did look at the dessert menu which contains classics such as panna cotta. 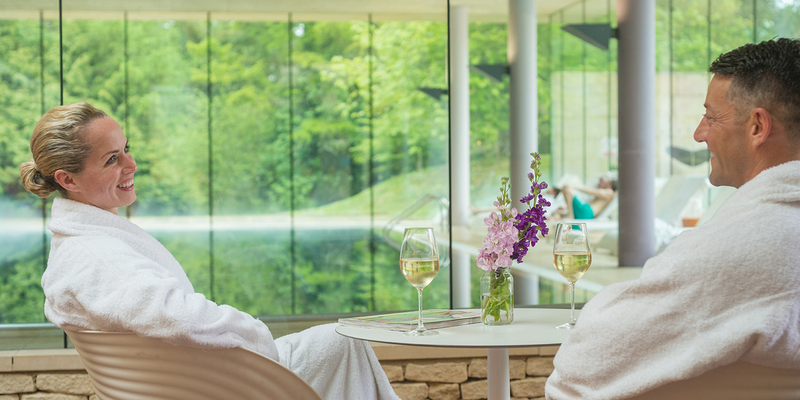 The open air, Mediterranean feel of the spa is refreshingly summery; the spa does a great job of bringing the beautiful surroundings into focus. The spa's own Green & Spring range of products, alongside American brand emerginC and Pinks Boutique. The relaxation room was too busy to escape to on our visit. Cowley Manor's romantic feel is well suited to couples: Grab a picnic hamper and go and find a secluded spot in the grounds. There are plenty of treatments on offer for male guests, too. We saw many Baby Mooners enjoying their time together. With both indoor and outdoor heated pools, families have plenty of space to splash around; kids under the age of 16 are welcome to use the pool between 8am and 11am, and 3.30pm and 5pm each day. 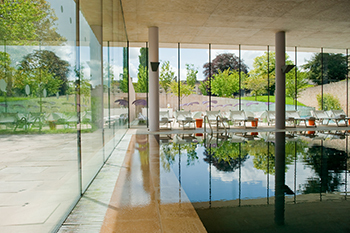 We awarded C-Side at Cowley Manor a Good Spa Guide Bubble Rating of 5 Bubbles for its stylish design, outdoor terrace, and imaginative treatments using its own Green & Spring products. Supreme Spy visited in September 2018 and awarded it 5 Bubbles. "Poor. How this has such a high rating is beyond me. No hotub, cold main pool, and bare bones basic steam room & sauna. Outdoor space looked okay. I would not put this in the luxury bracket. Grounds are impressive, but nothing to do with the spa itself.... Awful parking. Look elsewhere." Malt Restaurant serves an all-day menu, which can be enjoyed throughout Cowley. There's a separate evening menu and afternoon tea. Five room types available, from Good Rooms to Best Rooms. Rates start at £195 per room per night.